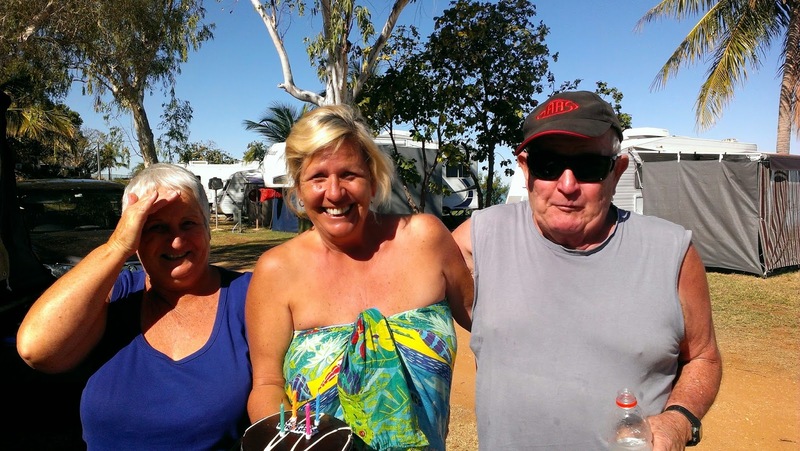 While we had a fantastic week in the Kununurra area, we were keen to get back out on the road again, to discover the next exciting part of our trip. 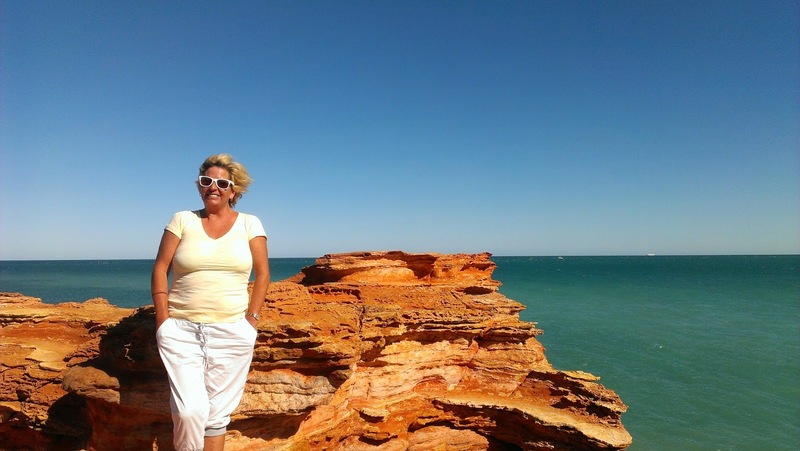 So to Broome it was! 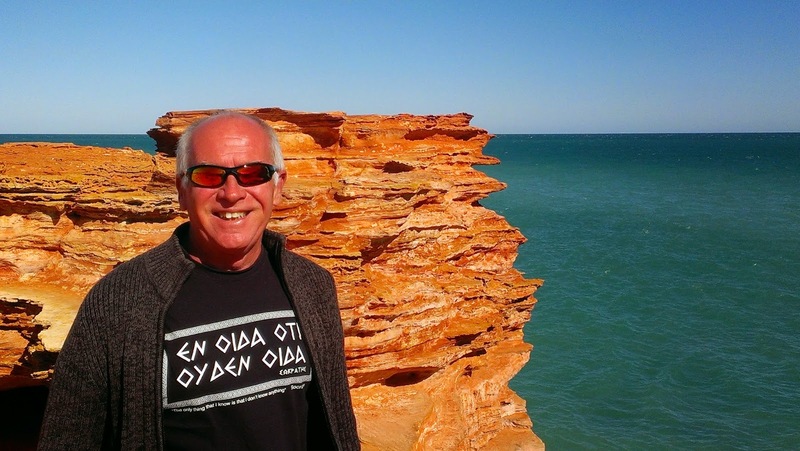 The drive from Kununurra to Broome is not the easiest, lots of winding roads, and the quality are definitely not as good and it seems to be a long and more exhausting drive than we had been use to. 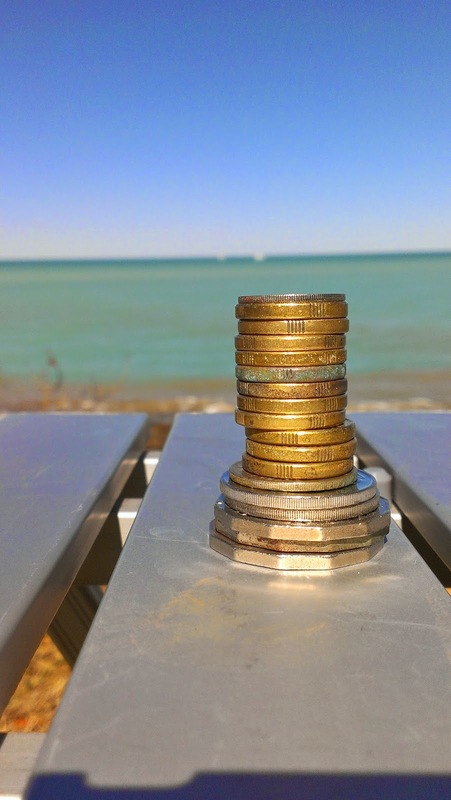 You need to be prepared to stop in the various little centers along the way to stock up on petrol to get you through, and it does require at least 1 over nighter on the road. The towns like Halls Creek and Fitzroy Crossing are definitely unique towns, but ones that everyone needs to pass through - Derek wanted to go to Wolf Creek - but if you have ever seen the movie you might have been on my side of this argument - no way was I turning off to see this attraction, to be honest both of these towns seemed like the movie. We decided to stay at Fitzroy Crossing so we could get closer to the destination of Broome, we were a little adventurous and stayed in a luxury safari tent (although it wasn't all that luxurious to be honest and at $160/night over priced), but hey when you are in these types of places it is what it is. 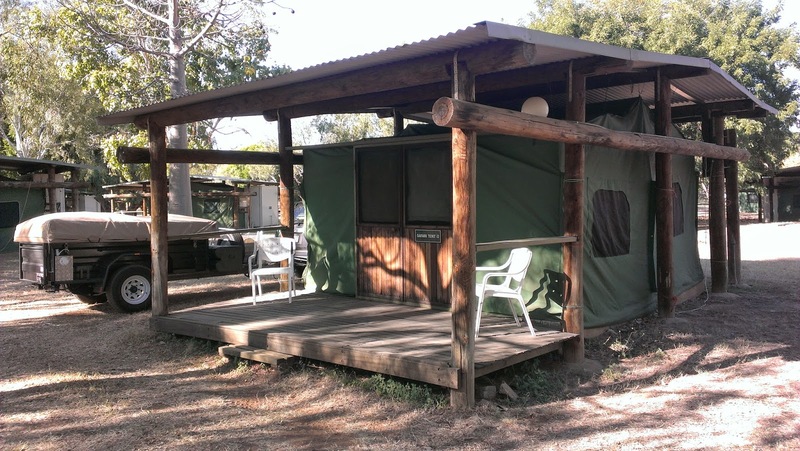 We tended to stay in cabins or accommodation like this when we wanted to hit the road early the next day and after long drives so we could be off early and more refreshed. We spent the afternoon looking through the town, and the camp ground/motel we stayed at did have a nice pub and restaurant all contained on a very nice and well kept property backing onto the Firtzroy River (we didn't do any tours here, but we met lots of people who did and stayed a few days here). 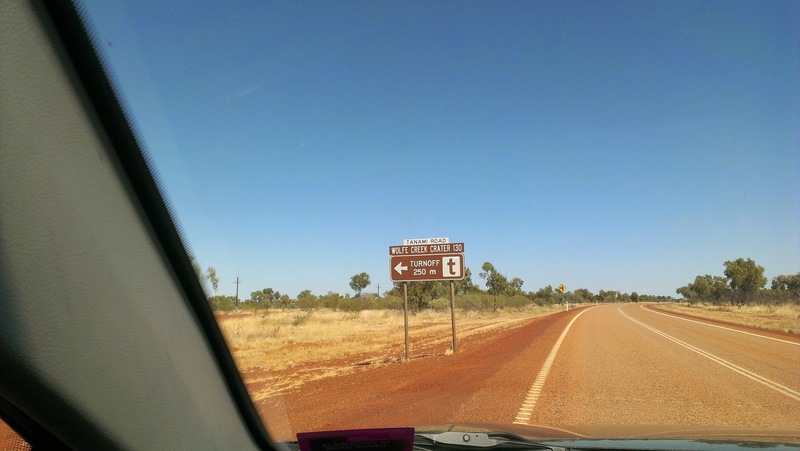 These towns are cross road type towns, they have a fair few facilities for tourists given nearly everyone has to pass through them either going to or coming from Broome. Lots of stories in these places so we enjoyed a lovely afternoon here having a chat to others and this is where you get the great info on things to do along the way. But Broome it was to be - I wanted to be somewhere nice for my Birthday so next morning we headed off to Broome and to sus out Cable Beach - being a winter baby I definitely wanted to be on the beach for my birthday. 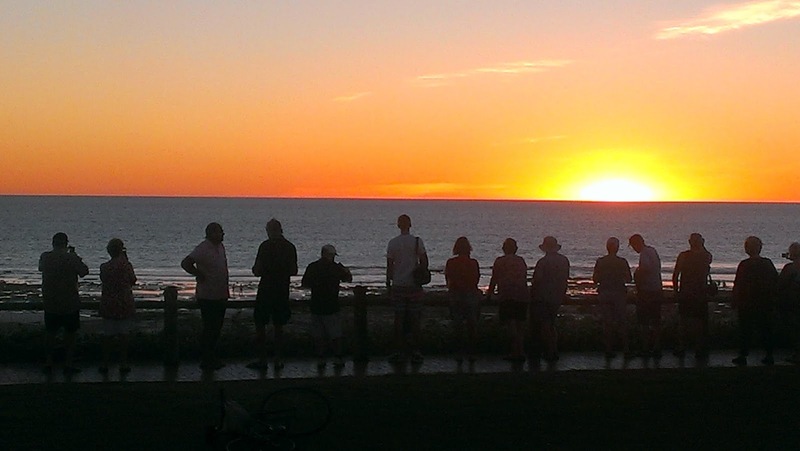 I had collected information on caravan parks and accommodation in Kununurra but I suspected from the maps etc that there were no caravan parks on the water at cable beach, and this is why I preferred not to pre-book because I like to drive past places first and establish is this where I want to be for a week. Definitely no beach side camping grounds here and it was packed with back packers, scooters, caravaners, campers and rental mobile homes - a big tourist destination at this time of the year - so strange for us. I suspected town beach would be the place for us - after all we still would have needed to get into the car to get to anywhere from the Cable Beach van parks so may as well be somewhere that is on the beach and town beach was it. 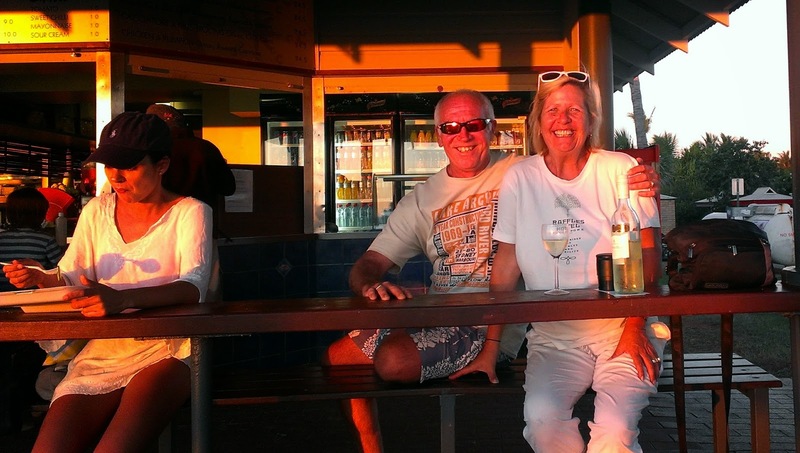 Once again I was pushing my luck but asked for a grassed site, with beach views (sometimes you have to ask the question) and to our surprise we got a perfect little spot for us, among some of the most wonderful people (all Western Australians who travel here every year for the sun). We were happy as and we had the most wonderful time here - it was really hard to pack up and leave when we eventually decided we had to move on again. 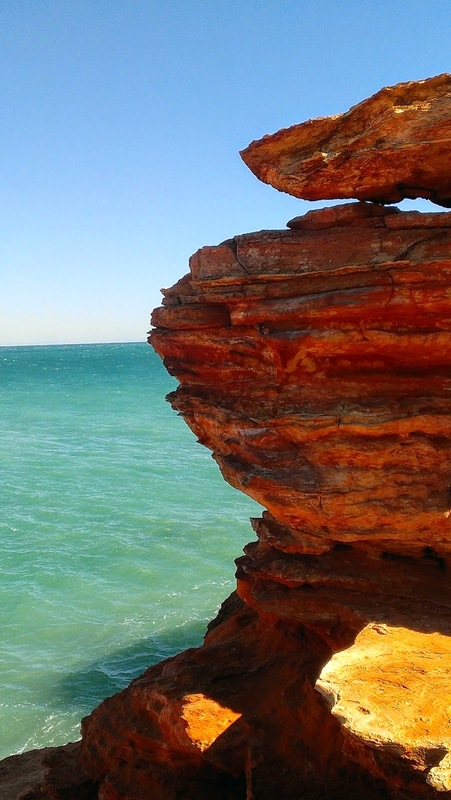 Broome is a fantastic town very lively, very touristy but without loosing its identity, no wonder so many head here. 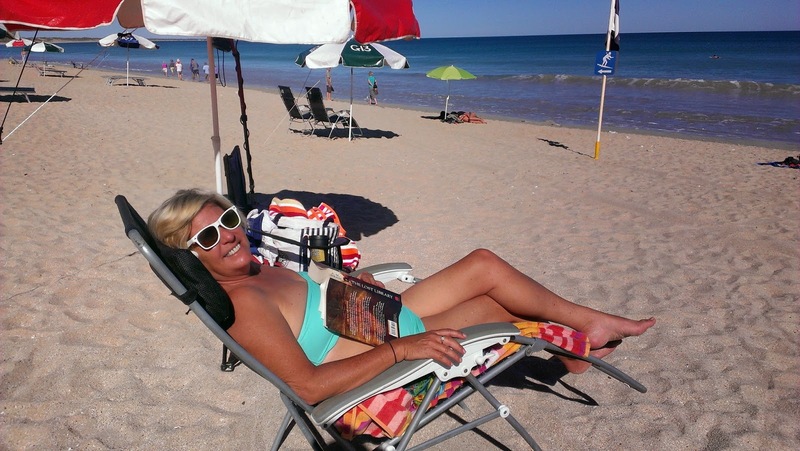 So I got my birthday wish, and had my very first beach birthday - you can hire brollies, chairs etc at cable beach so I setup for the day of reading, sunbaking and swimming - heaven. 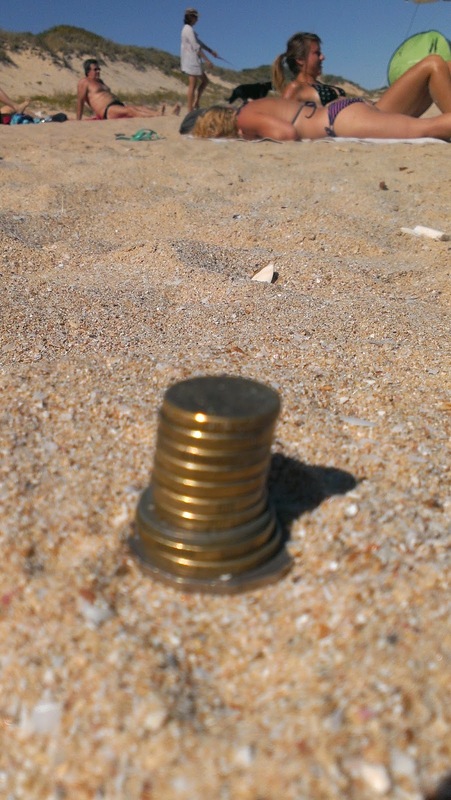 Derek started detecting the beaches and this was really the first time in the trip where he started to make some good money and share his finds and his passion with others. Our neighbours at the caravan site found out it was my birthday and surprised me with a cake and everyone signing Happy Birthday - that was so lovely. 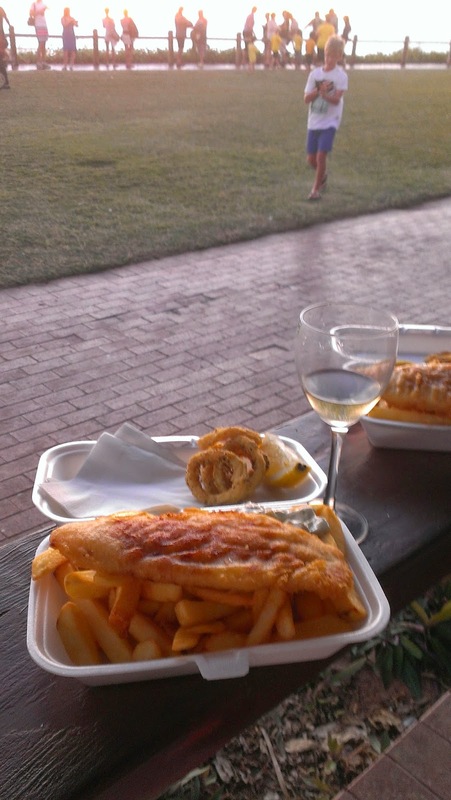 My birthday was finished off with fish and chips at sunset on cable beach (spectacular - no green flash though). If at cable beach there is a beautiful beach side restaurant called Zanders - but we had already been given the tip in Kununurra that if you walk behind the restaurant they also do take away at about a 10th of the price, so we decided to have ours at their cafe and watch the sunset with about 2000 other people, what a special day it was. While there are heaps of tourist activities to do here - flights, big day trips we were happy to sit and relax on the beach, read, and not do too much other than relax here - we could have spent a fortune on some fantastic day trips but this was really the first time in our trip that we just loved the environment and doing small day drives, and lots of beaching. The town center is lovely with it rich history of The Chinese Pearl farmers, Pearl shops everywhere, and generally an eclectic range of shops and attractions. This is where we first started to see the beautiful WA wild flowers - so red dirt, red mountain ranges, blue oceans and colorful wild flowers - this is what makes WA special at this time of the year, just color everywhere you look. They would however become more prolific as we headed down the coast.